I am a committed tea drinker; strong, black tea with lots of milk and sugar usually starts and ends my day, as well as carrying me through it. Recently, I was given the gift of a book titled The Way of Tea and Justice, by Becca Stevens, an Episcopal priest who heads Thistle Farms and the Thistle Stop Café in Nashville, Tenn. Both organizations are staffed by women who have survived prostitution, trafficking and addiction. The café is in fact a tea shop, serving fair trade, organically sourced teas from around the world. The book explores how that shop came to be; sharing the history of tea and stories of those women (and men) who grow, harvest and process our tea around the world. Reading the book on the long journey home from Tanzania to Toronto I was struck by the author’s comment that, “When we drink tea, we are connected to every tea drinker in the world by virtue of the common plant and the global trade.” Indeed, I enjoyed tea on this journey at the airports in Toronto, Amsterdam and Dar es Salaam, and in small, rural communities we visited in the Diocese of Masasi, and I did so again on the return journey home – strong, black tea with sugar and, when it was available, lots of milk. Conversations took place and connections were made over those cups of tea with the members of this delegation who came from across Canada and from all walks of life and life experiences. And conversations and connections with those we met in Tanzania were also made over tea. When I’m asked my profession on immigration forms, as we were on this journey, these days I write “adult educator.” Though I have no formal training as a teacher, I understand and experience my role at PWRDF as bringing people along on journeys of learning and connection – in their communities of faith and life, with others from across Canada and with those we call partners around the world. 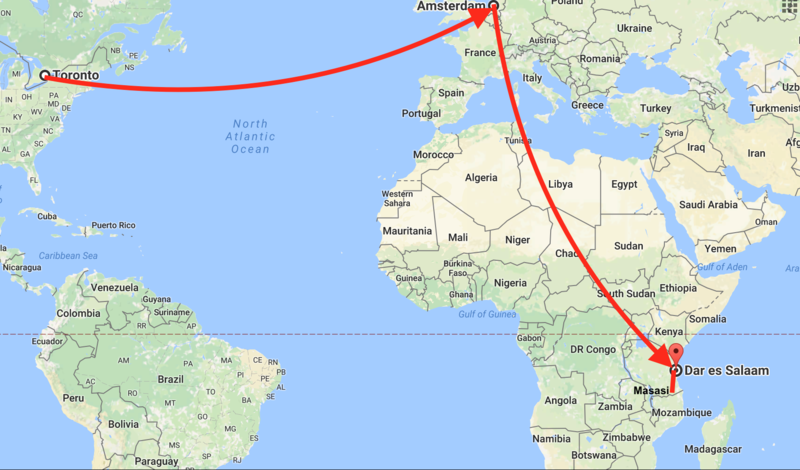 That, I believe, is what this journey to Tanzania has been about – connecting with and learning from one another and our development partners. Indeed, one of the “ah ha” moments that both the Tanzanians and Canadians listed in our final workshop/exchange together, was the “relationships” both new and long-term that have been made possible through PWRDF’s commitment to partnership. And so on Thursday evening last week, we said good-bye to Bishop James Almasi, his staff and the diocesan development program team. On Friday evening we said good-bye to Zaida Bastos, PWRDF’s Development Partnership Program Director as she prepared to continue her journey to Mozambique to visit partners there. At the airport in Dar es Salaam, we said good-bye to Geoffrey Monjesa, the Diocese of Masasi’s long-time Development Officer and our wise and gentle guide throughout our visit. In Amsterdam we said good-bye to Maureen Lawrence, PWRDF Board president, who would fly home to Nanaimo via Vancouver, to Geoff Strong, Diocesan Representative for B.C. flying through Calgary to Victoria, Asha Kerr-Wilson, Board and Youth Council member going home to Ottawa via Montreal, and Jordan Leibel, our intrepid videographer, heading to Regina via Calgary. In Toronto we said good-bye to Youth Council member Leah Marshall, flying on to Edmonton, to Chris Pharo, Diocesan Representative for Nova Scotia/PEI heading to Halifax, and to Bishop David Irving heading to Saskatoon. Toronto is home to the rest of us: Elin Goulden, staff with the Diocese of Toronto, Jennifer Brown, PWRDF Finance team staff, Andre Forget, staff writer with The Journal and me. I began this final blog with a cup of tea in the Amsterdam airport. I am finishing it with a cup of tea in my apartment in the Kensington Market neighbourhood of downtown Toronto; giving thanks for the conversations and connections, relationships and friendships made possible across Canada and around the world to Tanzania by the organization we call PWRDF. And I think it’s time for yet another cup of tea. Mom and a baby in Nachingwea. After staying the night at Mtwara, our group of 12 was all up at 5 a.m. for a quick breakfast and short drive to the airport, en route to Dar es Salaam. Our meeting with the Canadian High Commission was delayed by an unfortunate accident to one our members. PWRDF President Maureen Lawrence suffered a broken finger, cuts and abrasions from a stumble on uneven pavement within the High Commission grounds. This necessitated a trip to the hospital where she received first class treatment. The average per capita income of Tanzanians is only $570; 176th of 191 countries. Progress in human development increased from 163 in 2000 to 151 (of 188 countries) in 2015 on the UN Human Development Index. 44% of Tanzania population is under 15. There is a great shortage of qualified (and motivated) teachers, as well as of textbooks and desks. There is also a shortage of skilled health workers. Childhood mortality has declined significantly, although overall nutrition is dismal. The national maternal mortality rate has actually increased according to their information, from 432/100,000 population in 2012 to 556 in 2015. Our own data from Masasi District shows a definite decrease in maternal mortality since the inception of the Maternal Newborn and Child Health (MNCH) program, from 1,170/100,000 down to 650/100,000, meaning that Masasi is moving towards the national level now thanks to MNCH. Agriculture is manual labour-based (certainly in Masasi district), and transportation of agricultural products is a serious problem due to lack of good highways. With the national average economic and human factors either declining or staying steady, comparable improvements in Masasi District from the MNCH and food security projects are reassuring to say the least. Visual and verbal evidence provided to us this past week, and the enthusiasm shown by the farming communities were extremely gratifying. Our week also reaffirmed the value of PWRDF partnerships such as with the Anglican Diocese of Masasi, whose staff were instrumental in providing initial data, while maintaining a constant presence in these communities. Our group is eagerly headed home to family, but with mixed feelings for the new friends we leave behind. This was our last day in the district of Masasi, and ended with a long drive back to the city of Mtwara as we start to make our way back home to Canada. For the better part of the day, we had the opportunity to meet and share experiences with some of the leaders and implementers of the community health and food security programs from both the diocesan office and some of the villages where projects have been and are being implemented. PWRDF and Diocese of Masasi staff shared initial thoughts from their perspectives on the challenges and successes of the completed Preventive Health and Food Security project (2011-2016). We heard about the practical challenges of designing, communicating and implementing effective projects, but overwhelmingly the messages we heard from both sides were positive. The importance and value of the relationship between the Diocese of Masasi and PWRDF was expressed on both sides and there was shared sentiment that we look forward to continuing to learn from the challenges faced and work together to help move us forward with the new maternal, newborn and child health project (known as All Mothers and Children Count – 2016-2020). This includes taking into account the way these two projects intersect and overlap in ways that allow for continuity in the work. After hearing from the organizing leaders, we had a chance to discuss and share the key learnings the delegation and the community workers have gained about these projects. It was really incredible to hear that in many ways we have had very similar learnings, though we have engaged with these projects in very different ways. Both Canadian and Tanzanian participants shared that education that is relevant and contextual for those we interact with in this work, is key to delivering the messages we are sharing, whether that’s about food or health practices for the implementing communities, or understanding the issues and realities of development in Masasi for Canadian Anglicans. 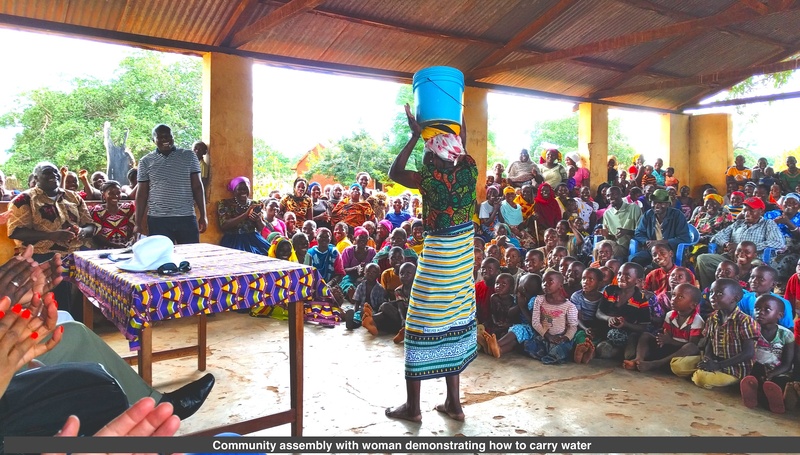 Our responses also highlighted the importance of relationships, between the Diocese of Masasi, the community workers, and the villages, between those working in Tanzania and those in Canada, and between PWRDF and Canadian Anglicans. It was another busy and exciting day visiting PWRDF Project “beneficiaries.” We headed off bright and early to Mkumba village. Our first visit was to the home of Hassan and Binurue. They were among the first recipients of one of 15 dairy cows distributed under PWRDF’s Preventive Health and Food Security program. The family had been selected to enter the random draw by the village council. This system is very democratic, reduces potential for conflict and also ensures that, at some point, all villagers who want a cow should eventually receive one. 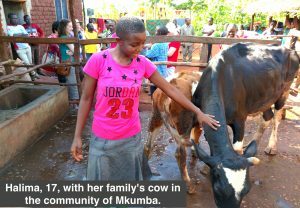 It was amazing to hear Hassan and Binurue describe the huge impact receiving this cow has had on their standard of living. They have already met their commitment to donate their first female calf back to the program. Currently they have a milking dairy cow as well as two calves. The income generated by the sale of milk has allowed them to acquire some dairy goats, make improvements to their home and be able to afford to send their daughter Halima to private school. We then crossed the road to visit a recipient of a dairy goat. As he is HIV positive, he had been struggling with providing for his family. All HIV positive recipients are self declared. (Goat keepers are both HIV positive and not named in order to protect the dignity of the HIV recipients.) By receiving the dairy goat he now has access to very nutritious milk which has improved his health. He has also been able to sell five offspring of the mother goat to generate some income for his family. As the result of the goat project, he has purchased a solar panel for his home. We then met with the town villagers, village officials and program officers. It is a tradition for visitors to any Tanzanian village to introduce themselves to officials and be welcomed officially. As this is a village with both Christian and Muslim inhabitants, the village Imam was invited to speak. He expressed gratitude to PWRDF for being inclusive and allowing all villagers to benefit from the program regardless of religion. 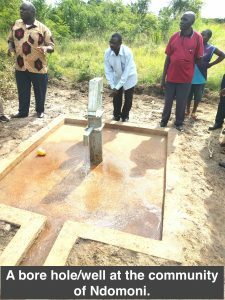 Our group then proceeded to the village of Ndomoni where we viewed a deep well that had been installed with PWRDF support. The well provides water to all villagers who used to have to travel up to eight kilometers for water. The well allows villagers to reduce the time they spend fetching water and spend more time on more productive activities such as farming. The traditional meeting with villagers and officials then took place. The meeting concluded with one of our own being given a lesson on how to carry a 50-pound bucket of water on his head!!! He almost got it the first time but still needs some practice. 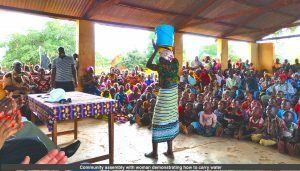 Seeing the daily realities of rural Tanzania has made me think frequently during the week of the well known piece of scripture from Luke – “from everyone who has been given much, much will be demanded; and from the one who has been entrusted with much, much more will be asked…” (Luke 12:48). I think of how fortunate we are in Canada with an abundance of food, water, health care and so on. I think of the many Anglicans I have met over the years as Diocesan Representative who live out their baptismal covenant and support our PWRDF faithfully. In meeting beneficiaries such as Hassan and Binurue, I have seen first hand how that support from home is changing lives here in Tanzania. We left Masasi early in the morning for Nachingwea where we paid a courtesy visit to the District Executive Director (local government official) who had helped coordinate the Preventive Health and Food Security project since its start. This project, supported by PWRDF and the Canadian government, took place between 2011 and 2016. Today was an opportunity to see some of the results of that project. Farmer and community leader Joyce Mtauka greets the delegation. 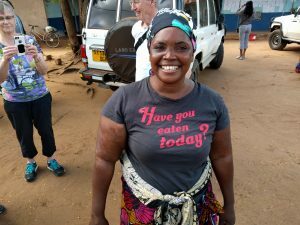 We then drove to the rural village of Ruponda to meet with project beneficiaries and farmers like Joyce Mtauka (below). Some of our delegation met Joyce during the PWRDF Sharing Bread (Two) food security course at Sorrento, B.C. in 2015. Through the program there, Joyce has been able to expand her production and in so doing, contribute to the food security of her community. Joyce was also involved with training many other farmers on food security and how to continue to benefit the community with their production. The delegation visited Joyce’s farm and after seeing some of her maize and cassava crops, had the opportunity to harvest and cook some fresh cassava. We helped chop the roots off of the short tree-like plant, and then proceeded to peel and wash the pieces. It was sliced into smaller sections and then the starchy plant was put to cook in a pot of water with a pinch of salt, before being served to us to be eaten with honey. Cassava is a high calorie, low nutrition crop, used as a staple throughout central eastern Africa. Joyce uses her cassava plants as a cover crop and gives branches of it for other farmers in her community to grow. Eating cassava was new and an interesting experience! After returning to the village for an honorary meal shared with the community, we visited the Mwenge dispensary which is powered by solar panels and allows for the delivery of babies at night through this PWRDF provision. We then continued our journey to visit the Chip Agro-vet Input Centre where we were surprised with a welcome of singing and dancing. Bishop James and Reverend Geoffrey had surprised us by not telling us that we would be there for the centre’s official opening. They even asked Maureen (as the President of the PWRDF board) to open the doors officially. 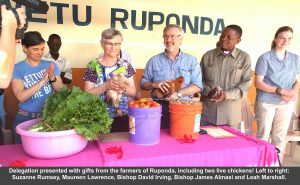 The Chip Agro-vet Input Centre, established by the Diocese of Masasi in collaboration with PWRDF and the Canadian government, is providing advisory services on agriculture techniques, agriculture and veterinary inputs, and how they apply. It is also selling the inputs at affordable prices to farmers, thus contributing to food security beyond the life of the PWRDF project. After a busy day we came to a hotel in Nachingwea to enjoy an evening and night of rest. Tomorrow the delegation looks forward to seeing more of the projects within the diocese and the effects they have had on the communities they involve. 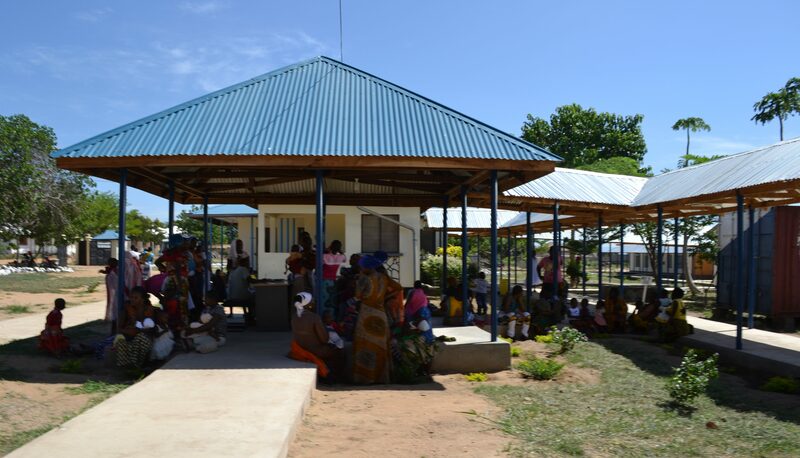 A recent photo of the Mtandi clinic. Another early morning as we were picked up by the Diocesan cars at 7:30 a.m. to visit three different sites where the Diocese of Masasi works with the support of PWRDF and Global Affairs Canada to support health care and food security. We saw the ever enlarging Mtandi clinic which began as a PWRDF Partners for Life project for HIV/AIDS and has now expanded to include a Maternal, Newborn and Child Health building, a labour room, delivery room, and a Rest House for patients who are unable to travel home for a few days after delivery, a dispensary and an eye clinic. The government of Tanzania would like the Diocese to make the facility into a hospital. This is a brief overview of a facility for which the Diocese of Masasi should be justifiably pleased and proud. While we were on site there were many mothers and babies in attendance for a well baby clinic. Back into the fortunately air conditioned vehicles and off to Nanganga for a visit to the dispensary there. It was at that time that we volunteers realized that a dispensary is really like a Nursing Station in Canada’s north! Although there are two major hospitals in the vicinity, they are privately run and much too expensive for many of the villagers. We were welcomed by the village chairperson, members of the village council and the special project committee for monitoring. At this site, which was small and cramped, there are an average of five deliveries a month. 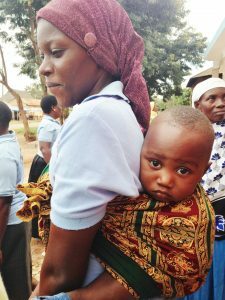 As at the clinic in Masasi, there is lots of pre- and postnatal education and all the people whom we met were most appreciative of the care and reiterated their appreciation for the work of the Diocese. Our other visits were to Food Security programs. At one site we learned how beneficiaries are chosen to receive a pair of goats. People who would like a goat are asked to write a letter to the project committee and village council, 10 are shortlisted, five are chosen and the other five will receive the first offspring of the first five pairs. We met two rather reluctant goats and a very happy owner. The benefits of having goats are improved nutrition from the milk, better gardens using the dung as fertilizer and the goats clear the weeds! At another community in Nanganga ward we were greeted by a long receiving line of men and women, and then the chief spoke. Representatives from three villages were present and we met folk who have livestock, farmers, project leaders, and community health workers who support pregnant women. We also visited a cow that a woman had received in January and of which she was very proud. It was 4 p.m. by the time we arrived at the Benedictine convent Nanganga for a late lunch but all agreed it had been a day well spent. Bishop Irving was pleased to help celebrate at the service of confirmation in the Masasi Cathedral on Mother’s Day. Bishop Irving was pleased to help celebrate at the service of confirmation in the Masasi Cathedral on Mother’s Day.When we got to bed Saturday night it was hard to sleep. The joyous welcome we received when we arrived at the cathedral just kept going around in my head. That more than 200 people had waited to greet us with song and dance and very big smiles was overwhelming. Eventually sleep came and so did the rooster at 4 a.m. If you dozed it came again at 5 a.m. just to make sure we were all awake. After breakfast we travelled to the cathedral for a Confirmation service with 85 young people and a Mother’s Day celebration. The cathedral was full with about 700 people from the city and surrounding area attending. Bishop James Almasi had very kindly invited me to preach and also assist with the Confirmation which I was delighted to accept. We had a wonderful procession with five city parish choirs, our delegation and a number of the diocesan clergy. The choirs sang and danced as we entered and throughout the service. It was wonderful. Although the service was four hours long, It went by very quickly and everyone in our delegation expressed the fact that they would not have wanted to miss it for anything. It was a great celebration and one I will remember for a long time to come. We left the parish and were taken to see the Diocesan Mothers’ Union guest house that is under construction. When complete it will have six bedrooms and bathrooms and will be able to cater both to visiting delegations and also to anyone else that would like to stay. It is totally funded by Mothers’ Union members and when finished the income from will be used on outreach projects around the diocese. We left Dar es Salaam as the sun was rising over the clouds and after a short flight landed in Mtwara, on the coast in southeastern Tanzania. There we were greeted by our guides Linus and Joyce and our drivers Evans and Edmond. According to Zaida Bastos, PWRDF Director of Development, the highway from Mtwara to Masasi has only recently been paved, and the journey that took us a little over three hours today used to take upwards of six or seven hours. There were hardly any shoulders to the road but many bicycles and pedestrians using it, occasionally with a small herd of cattle or goats. There were also many motorcycles – but hardly any automobiles. We passed cashew and coconut trees, tall stalks of sorghum (which looked like super-tall corn), sunflowers and ufuta, a kind of plant grown for oilseed. The buildings in the villages we passed were either traditional wattle-and-daub construction, with roofs of thatched coconut palm leaves, or made from cement bricks with corrugated iron roofs. The vegetation was lush and green against the red soil but Linus assured us that at times of the year it gets very dry and brown. Occasionally we would see a tall, thin pile of earth higher than a man’s height – a termite mound. We paused briefly at a crossroads where a busy market had sprung up and were immediately surrounded by men selling peanuts, sugar cane, coconuts, bananas, yams, roasted maize, even fish! A couple of us bought peanuts (which had been boiled) and sugar cane to share. As we approached Masasi the elevation got higher and higher and we started to see mountains in the distance. Finally we turned off onto a red dirt road that led to the Anglican Cathedral and Diocesan Centre. Here we were met by an enormous crowd – Bishop James Almasi and several of the clergy members of the Diocese, Geoffrey Monjesa, Director of Development, and several hundred laypeople, drumming, dancing, ululating, and singing “Karibu Masasi!”- “Welcome to Masasi!” Children were clapping and shouting “Welcome, welcome” and the elders of the community came up dancing to welcome us. 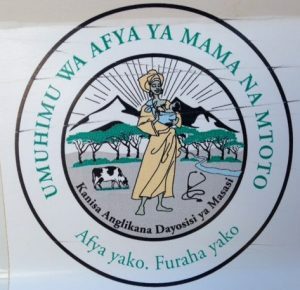 Most of the women were wearing skirts of kanga cloth imprinted with the logo of the Mothers’ Union. We later found out the community had gathered at 9 this morning to await our arrival at around 1:30 p.m. The exuberant, abundant joy of the greeting was overwhelming! We were invited into the cathedral where PWRDF Board President Maureen Lawrence was presented with a bouquet of flowers. After some hymns and prayers, we were given the opportunity to introduce ourselves to the community. Over lunch in the Diocesan centre guest house, we learned that not only Anglicans but Muslims had come out to welcome us. There seems to be a great deal of interfaith cooperation between Christian and Muslim in Masasi – the two faith groups work side by side in development projects, attend each others’ celebrations, and so forth. In a time where we hear so much negative news about relations between people of different faiths, this is a welcome example of mutual solidarity. After an afternoon rest, we returned to the Diocesan Centre for dinner with the Bishop and several of his clergy. We ate outside under the myriad stars. 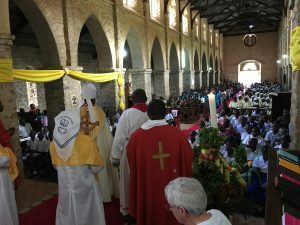 Bishop James spoke eloquently of how, through PWRDF’s partnership with the Diocese of Masasi, Canadian Anglicans have made a tangible expression of God’s love and compassion that has changed lives. The warmth of the welcome we received is a testament of that. The rest of this week we will see firsthand the work that this love has made possible. After a long day of travel we finally made it to Tanzania. 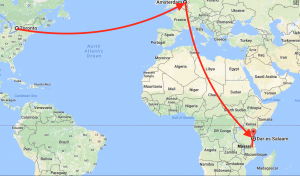 The overnight flight from Toronto to Amsterdam was long and hot. After a four hour break to stretch our legs in Amsterdam airport we boarded another 10 hour flight on to Dar es Salaam, Tanzania. Unfortunately many of us did not get an adequate night’s sleep on our first flight, so consequently many of our party slept soundly on the second. After briefly stopping in Kilimanjaro to let some passengers off, we landed in Dar es Salaam around 11:30 p.m. Tanzania time. It was here, that we had four hours to have a brief sleep and rest in a local hotel prior to our continued journey the following day. Upon driving to our hotel, one of the cabs got stuck in a pothole bigger than the vehicle itself! We were not left helpless though, as dozens of local youths came to our aid and rocked the little car out of the rut. Coming out of a rainy season, the roads in the city had large puddles strewn across them. We continue our journey to Masasi tomorrow, (May 13) wearing fresh coatings of sunscreen and plenty of mosquito spray. It was an exciting day, and it feels great to be on the ground in Africa at last. 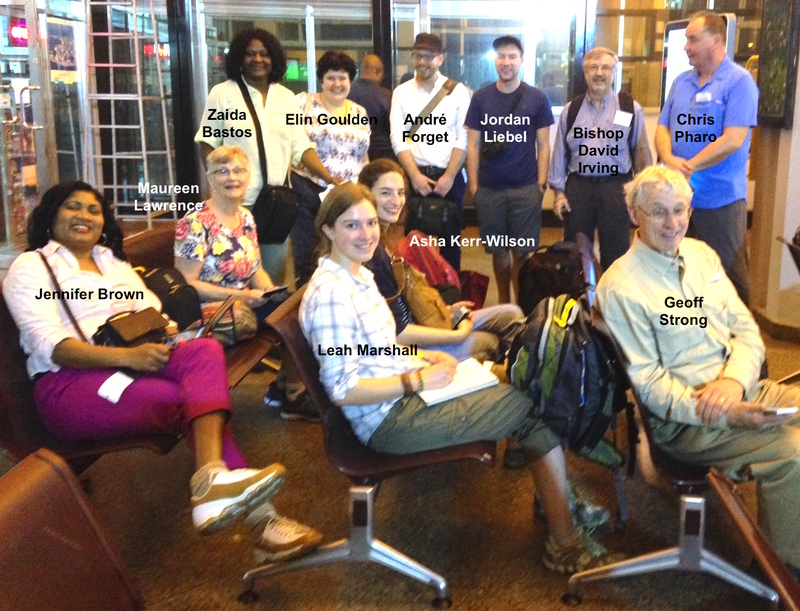 On Thursday, May 11, a 12-member PWRDF delegation will depart from Canada for a 10-day visit to the Anglican Diocese of Masasi, a long-time PWRDF partner in southern Tanzania. As the final “learning exchange” of the three-year Fred Says Food Security campaign, the visit follows on the 2015 Sharing Bread (Two) food security course at the Sorrento Centre in B.C. where PWRDF was joined by Masasi’s development coordinator, Geoffrey Monjesa and farmer and community leader, Joyce Mtauka. Among the delegation’s activities will be visits to several communities where PWRDF has partnered with the diocese to carry out food security projects and maternal, newborn and child health initiatives. The current program, All Mothers and Children Count (AMCC), is also supported by Global Affairs Canada. The delegation will also celebrate Mother’s Day at the Anglican Cathedral in Masasi, where delegation member Bishop David Irving will preach and 70 young people will be confirmed. They’ll also spend time working on Joyce’s farm, meet with diocesan staff and community leaders involved in the AMCC program and, at the conclusion of the visit, meet with Canadian officials at the High Commission in Dar es Salaam. Delegation members will be blogging daily about their experiences at pwrdf.org, and sharing their impressions and learnings with parishes and dioceses in the months to come. The delegation is made up of members of the PWRDF board of directors, diocesan representatives, members of the youth council and staff. A videographer will be joining the group, along with a journalist from The Anglican Journal. The trip was made possible in part by a generous grant from the Diocese of Toronto’s Our Faith, Our Hope campaign, and through contributions by the delegation members themselves.